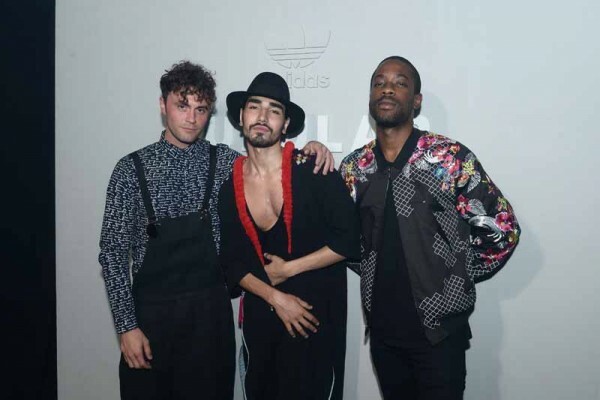 A very informal and casual red carpet, the adidas Original Tubular Spring/Summer 2016 collection launch during Paris menswear week attracted sneakers aficionados that included Mikky Ekko, Willy Cartier and Ugo Mozie. Launching four new styles, Nic Galway, vice President of Global Design at adidas Originals and Dirk Schonberger, adidas Creative Director welcomed guests at the underground venue where by a group of local performers, freely moving around architectural obstacles showed what the new SS16 Tubular collection can do. The Tubular’s lightness and agility was embodied in the athletic presentation, highlighted by an intricate light show and scored by prolific Parisian sound engineer and DJ Michel Gaubert. Created by the adidas design team directed by Nic Galway, vice President of Global Design at adidas Originals, the Tubular trainers belong to a new generation of radical footwear, a contemporary take on a classic adidas Originals shape from the archives – the adidas Tubular 93. Galway previously helped launch high-profile designer collaborations with, among others, Stella McCartney and Yohji Yamamoto (Y-3), adidas by Rick Owens and successful adidas footwear styles, such as Pure boost and the Y-3 Qasa.